Adding a new product to your WooCommerce powered website is simple. From your Dashboard, look in the left column and scroll to find Products. Click on Add Product. If you are updating an existing product, choose All Products and find the product you wish to edit. The next text box you will see is for the product’s long description. Come back to this section after you read about the Short Description area. The following sections are all extra options and features. You may not need all of these sections for your product. Next choose the Inventory tab to add a SKU and stock status. Stock status is used if you want to manage your inventory and display an “out of stock” message when all quantities have been purchased. If you have a product that is always available, you can leave this part blank. If you checked “Manage stock” box in the previous step, you can use the stock status tab to customize the wording for your inventory levels. If you are using the weight of your products to calculate a shipping price, you will use the Shipping tab to enter those details. If your items ship with a flat rate or free shipping, you can skip this tab. Attributes are used for products with variations. This is where WooCommerce gets very sophisticated for complex products. If you are selling basic products with no variations, you can skip this tab. More on how to manage the Attributes in a future blog post. The advanced tab allows you to add a Purchase note to the buyer, adjust the menu order, and enable/disable reviews. Menu Order: If you would like your products to appear in a particular order on your shop or category pages, you can set the order for the products here. Reviews: Enabling reviews allows visitors to post reviews directly on your product page. You can uncheck the box to remove reviews from the page. 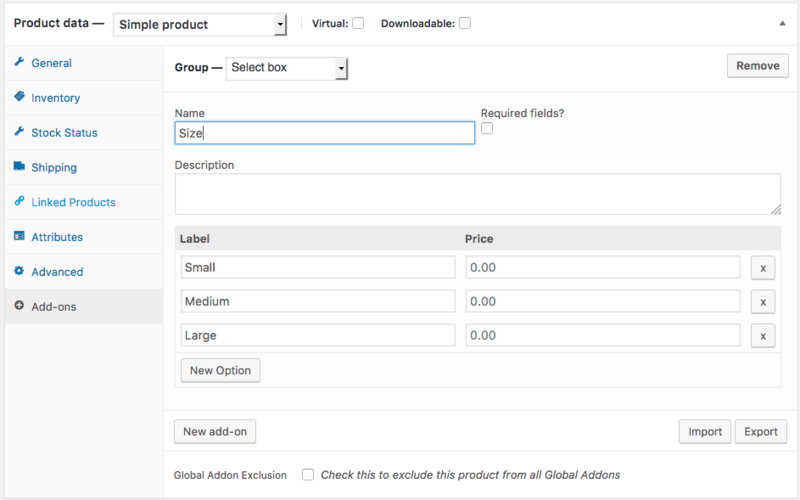 The Product Add-Ons extension allows you to create additional product personalization options. If you would like your customer to customize your products by adding new options such as input boxes, dropdowns or checkboxes, this plugin will do the trick. You can use it for basic options such as size or color. You can also use this section for add-on items such as extra parts or variations of your product. The price column allows you to charge an additional amount for these add-on items. Keep in mind this adds to the general price. If my item is $50 and they add Extra Cable for $20, their price will display as $70. Below the Product Data section you will find the Short Description box. The short description is the primary description area. If you have a long description or extra details (dimensions, product specs, etc. ), you should consider using the long description (text box at the very top of the page) in addition to your short description. Along the right column of your page, below the Publish box, you will see a box for Categories. Here you can organize your products by category. You can add a product to multiple categories by checking the boxes next to each category. Below this, you will see a section called Tags. Rarely do I use this section so you can skip over it too! Click Set Product Image to upload the main product image. You can add additional product photos in the gallery section by clicking Add product gallery images. 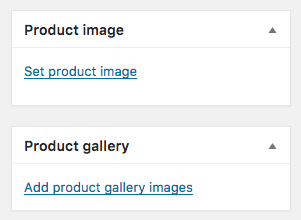 Your additional gallery images will appear as thumbnails below your main product image. 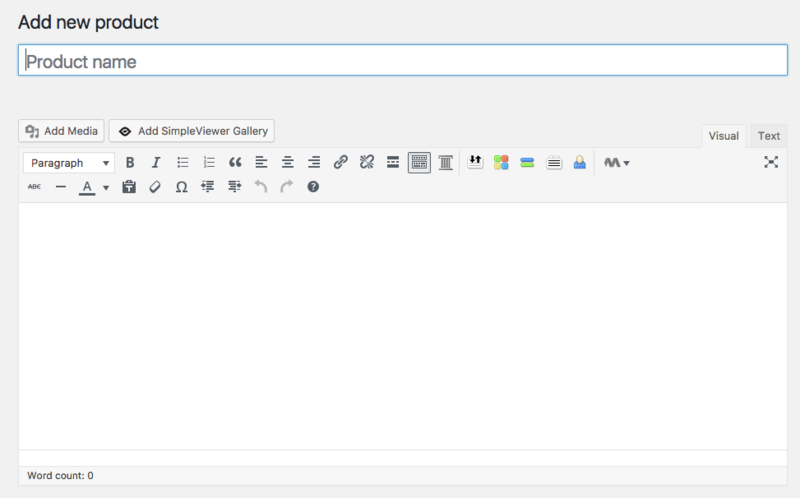 Once you have entered all of the details for your new product, use the blue Publish button in the top right of your page. If you are updating a product, this button will be called Update. This will save and publish your new product.